Transforming Hollie: BTW...I got a blog award! 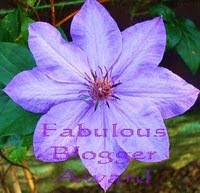 I got this FABULOUS Blogger Award last week from Jer, at Jer is Losing It. Have you read this blog? OMG... This woman is one of my biggest inspirations. She has come such a long way - she's lost over 100 lbs and is still going! I think I am supposed to pass this on... and you know I usually won't name specific blogs... but today I am! 1. A Deliberate Life - I love Chris's writing style. She, too, has had amazing progress and inspires me daily. 2. A Merry Life - Mary is so real... she struggles just like I do, and sometimes if feels good to know that you are not alone on this journey. 3. Eating Journey - I love Mish because she is also one of the most REAL bloggers out there. I love her spirit and determination. 4. My Journey to a New Life - Kelli never gives up. She tries so hard and does more than most people would do in her situation. I love her, and I always think of her when I want to make up excuses to why I can't exercise. 5. Dropping the Pounds, Picking up my Life - Trina is struggling right now and can use some support. I can identify with her on SO many levels. Way to go on the blog award. You totally deserve it! Congratulations! Aw! Thanks so much!! It's weird being called an inspiration but I'm trying not to let it weird me out, haha.